Deep in the south of the country, the CoderDojo story inspired Nicolas Focant. So he started his own CoderDojo at the Greenlab Coworking space. Having some trouble finding coaches, he and another coach hosted their first Dojo for 17 children. Luckily, they got some help from the parents as well. There is no doubt that their enthusiasm will spread really fast! Good luck Arlon! Katrijne used to be a coach at CoderDojo Roeselare. However, some time ago she moved to Antwerp and had to stop coaching in Roeselare. So Katrijne opened up her own Dojo in Berchem with some help from Cindy and her ‘Digitaal Leslokaal’. If you looked at the Dojo locations map, there was one big empty spot in Flanders: the vicinity of Diest. Kurt thought it was about time to launch a Dojo in Diest, so he called for help on social media and gathered a team of technology enthusiast. After a first meeting, they decided to launch a CoderDojo together! At Fontaine l’Evêque (a small town just outside the Charleroi urban area) Véronique from the local library founded a new Dojo. Already hosting an EPN, this library is really dedicated to helping people gain some digital knowledge. With a fleet of robots and a lot of coding books, this Dojo has everything to become the next hub for digital talent in the region. There are many Dojo’s in the sandy region called ‘De Kempen’. However, until recently, there was no Dojo in its capital Herentals. 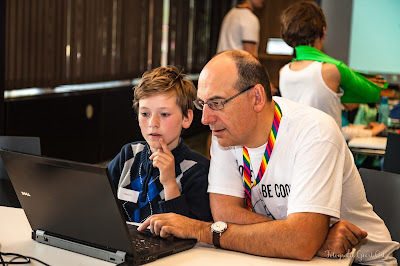 "What a shame", thought Jan, who was already enthusiastically attending CoderDojo with his son in Turnhout. So he gathered a big team of coaches and started his own Dojo in Herentals. The new CoderDojo season has started and in many places, people seized this opportunity to start a new Dojo. Lead Coach: Maarten Hendrikx Maarten hosts the Dutch spoken tech podcast tech45.eu (http://tech45.eu/) together with co-hosts and CoderDojo coaches Toon from Lier and Floris from Sint-Niklaas. Toon and Floris spoke so enthusiastically about CoderDojo that they convinced Maarten to start his own Dojo in Bilzen. CoderDojo Bilzen, broadcasting since September 2018! What makes Aalst special? We have an amazing team in Aalst.Our team is a perfect mix of developers, hardware specialists, professional teachers and people that are just really enthusiastic about CoderDojo. Not forgetting our superb cooks who make sure that the coaches can concentrate on teaching. My team is a happy bunch of ladies, gents and ex-ninjas ranging from 16 to 60.I love all of them. This team of 20 people makes our Dojo very much alive and fun each month. Aah... summer at last! It’s that time of the year when the sun is bright in the sky and the birds are singing along with the tune of the ice cream truck. For coders however, this can be a stressful time. Sunshine is blocking the brightness of their screen, computers are overheating more rapidly and online servers are a desolate place. So what to do for coders on a sunny day? Well... code outside, of course! Here is a list of 6 things you can do outside that involve coding. 1. Play Scratch Unplugged life size versionScratch Unplugged is a board game developed by our friends at Codescool. It is perfectly suited for a life action outdoor game. Coders gather in teams of minimum 2 players and start coding their way through a field of bombs and walls. Draw your play field with chalk or use sticks and rope to make one on grass. You can find all the rules here: http://www.scratchunplugged.com/.